The Tatarstan Investment Development Agency (TIDA), in conjunction with the Thomson Reuters Agency, has developed a five-year plan for the creation of a Regional Center for Islamic Finance of Russia and the CIS in Kazan. According to estimates developed by Thomson Reuters, the CIS countries during this period may raise about $28 billion in investments from Malaysia and countries of the Cooperation Council for the Arab States of the Gulf (CCASG). To coordinate the financial flows, the developers plan to create a regional regulatory bank in Kazan. According to the proposed plan, the creation of the center will require $11 million in investments into educational, counseling, methodological and other programs. Project ideologists have not yet named their sources of funding. It is quite clear why Kazan has been chosen as the hub for Islamic investments. Tatarstan has accumulated considerable experience in international projects and contacts with investors from Muslim countries. 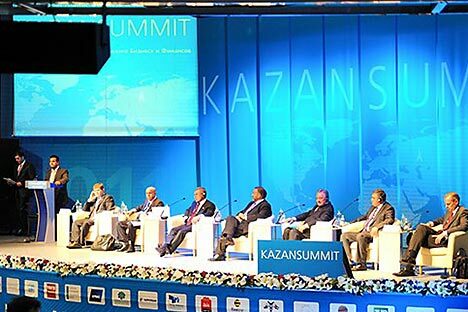 Kazan has repeatedly hosted major international events devoted to Islamic business and finance. Support and widening of investments will be one of the key issues at the upcoming Fifth International Economic Summit of Russia and the countries of the OIC, which will be held in the capital of Tatarstan in October of this year. “According to various estimates, the potential size of the retail market of Islamic finance in Russia ranges from a modest 10 percent of the total number of religious Muslims to the entire Muslim population (10–15 percent of the population of Russia as of today, which is forecasted to reach 30 percent by 2050). Muslims returning to their religion and experiencing a growing desire to live and work in accordance with Islam is sure to give impetus to Islamic financial instruments,” says Brugnoni. However, some experts are not convinced that all the ambitious plans of the Kazan center will be implemented. According to Alexander Akimov, head of the Department of Economic Research of the Institute of Oriental Studies at the Russian Academy of Sciences, the idea of establishing a center for Islamic finance is not new: It emerged five years ago, but was never been developed. He does not rule out the possibility that Islamic finances will simply purchase existing assets instead of creating new projects. As for the areas of investment, according to the experts, it will be the real sector; primarily this will be infrastructure and oil refining. “Islamic finance is closely linked to the real sector of the economy. It has been estimated that Russia needs more than $1 trillion of investments into infrastructure over the next 10 years, and Islamic finance fits perfectly well into these volumes,” Brugnoni says. According to Akimov, investments into agriculture may be attractive to Islamic partners, for example, in the Volga Region, where they can participate in small inexpensive projects. However, this plan may face some legal challenges. “First of all, lending in Russian banks is based on the principle of serviceability, maturity and repayment. Serviceability implies payment of accrued interest on a loan, which, according to Islamic law, is forbidden for financial institutions and individuals. In addition, one of the instruments of Islamic banking is the so-called Murabaha—a contract for the sale of goods between a seller and buyer at an agreed price, which also indicates the amount of the profit or markup. This form of transaction is prohibited by Russian law. As long as the law does not change to allow for Islamic banking and financial products, consumers will have to use investment and leasing tools,” says the press service of TIDA. Business could become the driving force for stimulating changes in the law, but, so far, it has not displayed the proper degree of activity.